I have some exciting news to share today: Stonyfield is now a part of Target’s Made to Matter program! I fact, Stonyfield is one of 31 brands – including Justin’s nut butter, KIND bars, and their in-house Simply Balanced line – in Target's collection of products that promote better living and sustainability. Made to Order participating brands are organic, non-GMO, non-toxic, fair trade...and more! I love that I can use these items and feel good knowing they're better for me...and the environment too! Beyond offering exciting and delicious flavors, Stonyfield is excited to be part of a program that focuses on companies making a difference to both the environment and healthy eating. 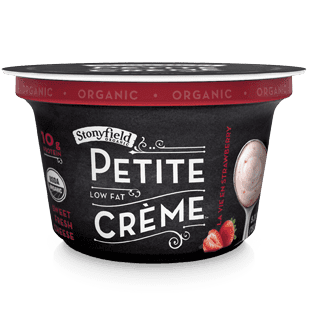 If you’re looking for Greek yogurt with a little something extra, Stonyfield has got you covered! They’re featuring a pair of new Target Made to Matter exclusive items: Stonyfield Organic Super Seeds and Stonyfield Organic Super Grains Greek yogurt. Organic Super Seeds features nonfat Greek yogurt and softened flaxseed. It comes in orange-cranberry, blueberry, and coconut flavors. Organic Super Grains pairs nonfat Greek yogurt with buckwheat and quinoa. It comes in strawberry, maple, and vanilla flavors. Each 5.3-ounce cup of Greek yogurt is packed with protein for a wholesome, satisfying snack anytime. As an added bonus, all six new flavors are certified both organic and gluten-free -- and they’re delicious to boot! By late August, you’ll be able to find these new Stonyfield Greek yogurts with added grains and seeds on Target shelves nationwide. Now that I’ve recently entered a new decade in my life, I try to make each day really matter! That includes ensuring that I include plenty of wholesome foods in my daily diet. That can sometimes be a bit of a challenge during the hectic work week. Thanks to Target’s Made to Matter lineup (and a little bit of advance planning), I managed to pack an entire work day of healthy meals and snacks! For breakfast, I enjoyed a Maple Glazed Pecan & Sea Salt KIND bar topped with delicious all-natural Justin’s Vanilla Almond Butter in a convenient single-serving pack. This pairing tasted great and provided me plenty of protein and fiber to keep my energy level high all morning long! My lunch was a frozen Beef Stroganoff meal from Target’s Simply Balanced brand. It was tasty and filling, and the beef was hormone-free. My afternoon snack was a bag of crunchy freeze-dried mango slices, also from the Simply Balanced line. The entire 1.5-oz package contains three servings of fruit and just 160 calories. The mango pieces are lightly crispy, with a nice balance of sweet and tart. I rounded out the afternoon with a container of Stonyfield’s Strawberry Petite Cream when I got home. It's my favorite Stonyfield product -- so creamy and rich! With just 2.5 grams of fat and 10 grams of protein, it really helped tide me over until dinner later that evening! 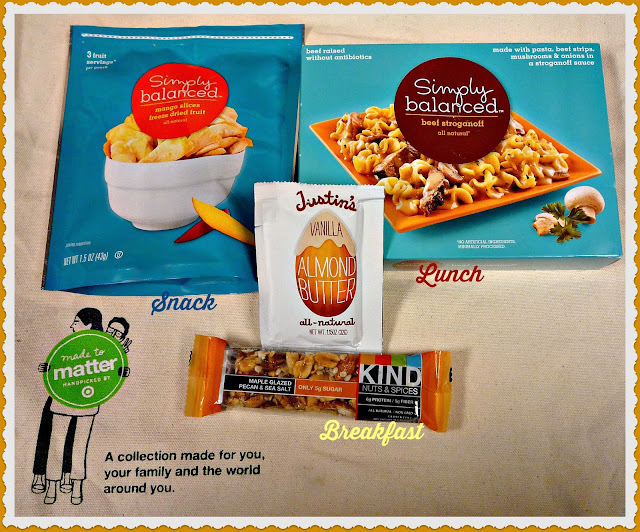 The verdict: my lineup of Made to Matter products kept me satisfied and energized during a very busy weekday. To learn more about Made to Matter brands at Target, simply visit the program’s dedicated webpage. Disclosure: As a Stonyfield Blogger, I received samples of some of the Target Made to Matter products and compensation. As always, all opinions here are my own!